Teri Ringham Health and Wellness | Why are Gut Issues the Second Leading Cause of Missed Work days? Why are Gut Issues the Second Leading Cause of Missed Work days? 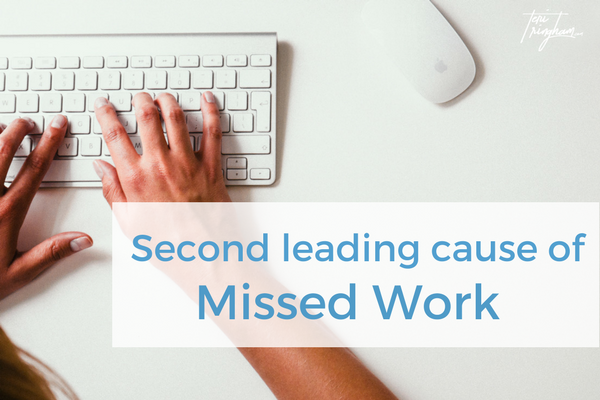 Why are gut issues so prevalent that they are the second leading cause of missed work days? In my opinion and many alternative health proponents belief, it’s because doctors–and patients– are treating gut symptoms rather than treating the root cause. The gut issues get labeled as a disease rather than what they really are…a condition. When we look at gut issues with the understanding the symptoms are a condition–not a disease–we acknowledge this condition, with the resulting symptoms, were created in the body. Once we realize this, we also know conditions created can be “un”created or, at least, often greatly relieved. IBS (irritable bowel syndrome), without including the other digestive health issues, is the second leading cause of missed work, according to The Inside Tract® newsletter from October 2005. IBS symptoms result in this condition ranking right behind the common cold for missed work days! It affects roughly 15% of Americans and accounts for approximately 12% of primary care visits. This fact is only for IBS. Now imagine if we include the statistics for other gut/digestive related conditions, as well. Overall, the numbers reflect an out of control health issue that is not being served well by standard medical care. IBS, known as Irritable Bowel Syndrome is a condition that manifests with symptoms such as constipation, gas, abdominal pain, bloating, diarrhea or gas AND diarrhea. IBS plagues all ages from young to elderly. No matter the age, one of the symptoms that interferes greatly with a persons social life are the mad dashes to find a bathroom. What is IBS? It’s a diagnoses given when no other gut issue diagnoses “fits”. It’s a diagnoses of exclusion by ruling out diverticulitis, Crohns, GERD or other intestinal conditions. In other words, it’s a set of symptoms that don’t fit under other gut conditions labels. A condition was created. Can it be “un”created? Therefore, like many conditions that are given a label, we are diagnosed with a condition and too often assume it means “disease”. There is a huge difference. A condition is created in the body (you weren’t born with it-right?) and a condition can very possibly be “un”created in the body. There are extensive lifestyle factors coming into play when our digestive system is signaling a problem. And yet…our medical system proposes to treat the condition with a one pronged approach: a pill. A pill with extensive listed potential side effects and a pill you will likely be on for the rest of your life. The approach of using a pill, puts us in a holding pattern-at best- of hoping each day will be a good day. This is because the medicine approach is treating the symptom-not the cause. If we don’t change the situation that created the condition, a pill is extremely unlikely to heal the complicated interactions and responses in the body that cause the IBS or other gut condition symptoms. Rather than buying into the “its in our genetics” theory, what if we look toward the foods we eat being one of culprits? Think of foods that irritate our gut lining like “sandpaper to a wall” for damaging our gut. A damaged gut is a distressed gut. A distressed gut has only one way to send out a distress signal: through symptoms. The symptoms of not only IBS but also Crohns, acid reflux, bloating cramping, GERD etc. When we look to root cause of digestive issues, it often comes down to a damaged digestive system that is just plain old exhausted and stressed beyond its abilities to function in the manner we expect it to function. This is not to say genetics never affect our health. However, far too often genetics are blamed when, in reality, we can “pull the trigger” on genetics for a large number of health conditions. We can greatly influence our genetics through lifestyle and diet (called epigenetics). Since diet and inflamed gut can contribute to many gut health conditions, it’s important to look in this direction-not only for gut healing but for the ramifications this condition has on entire body health. We can go the route of accepting the genetics explanation and taking medications OR we can take a hard look at our diet and lifestyle. The latter involves more effort, of course, but offers more hope for long-term improvement. Our digestive system encompasses one full tennis court of sq ft in the body. For this amount of space to function properly takes a great amount of care and proper nutrition through the foods we eat. Each day we ingest pounds of substances (food, drinks, medications, and supplements) that get delivered directly into the digestive system. Each time, we are hoping that our bodies will be able to filter friend from foe. Overall, our bodies do an impressive job—even though much of what we put in our mouths-GMO’s (genetically modified foods), processed foods, preservatives, chemicals…all were foreign to the environment in our forefathers day and to the human body that was not designed to digest these substances. Thus, we have a system in distress. Based on skyrocketing statistics and the number of doctor visits per year for gut issues, we–our digestive system– are slowly losing the battle of trying to recognize and break down these foreign substances. use a daily high quality probiotic for proper microbiome balance. There are many good brands. The key is to avoid the “big box” store brands and to watch for a company that specializes in this area. This brand is one I like for quality and price. Soothe the digestive system. Many cultures chew on Fennel seeds after meals for good reason. It aids in digestion and has a soothing effect on the gut while it does its job of digestion. Essential oils such as Fennel Vitality or a blend called DiGize Vitality (think Di-gestion) can soothe in the same manner as Fennel seeds. Eat REAL food. Food in a bag or a box has a high chance of preservatives and other chemicals. The processing in these foods damages or destroys the natural enzymes most whole food has naturally as part of its intricate make up. A damaged gut creates the unfortunate situation of Leaky Gut that allows toxins into our blood stream through the damaged gut lining. This leads to a multitude of health issues. Repairing gut lining is as important as soothing it. This brand of “dirt” is one I keep on my kitchen counter and use daily for support of my digestive system to avoid or repair Leaky Gut. These first steps relieve physical stress on our digestive system. Mental stress is also a big player in causing gut issues so it’s vital to find stress relieving strategies such as meditation, yoga, gentle exercise. These are simple strategies that go a long, long way toward relieving the continual damage we do to our (very large) digestive system. Relieving and soothing an inflamed and disrupted system is the first step in relieving symptoms and allowing the body to work toward healing. “I’m feeling really well! In fact, I had a colonoscopy at the beginning of April – just routine – and it came back really good. No inflammation at all, and am in what they call “remission”. Thanks so much for all your help.” -Danielle T.
How about you? Are you struggling with gut issues? If so, your first “baby steps” might be to reduce/eliminate gluten (remember the sandpaper effect) and add the aforementioned liquid aloe vera to your drinking water. Take these first two steps to start you on your path to a less irritated gut. Are these the only changes? No. That would be too simple 😉 But..these two changes may give enough soothing to help you see changes that bring positive results enough to encourage you on this path. As you implement the changes listed above plus others listed in my book to soothe the gut and come to the place of wellness where Danielle T has gotten, you will find you can enjoy eating and life without fear of making mad dashes to the restroom. If you are an essential oils user, you can support your newfound gut wellness with soothing essential oils like Peppermint, Ginger, Fennel OR I use the Digize Vitality blend in capsules (DiGize contains the single oils of Peppermint, Anise, Fennel, Patchouli, Tarragon, Ginger, Lemongrass). Living with the fear of getting too far from a bathroom, avoiding social events, fear of when and where the next attack might strike…this is surviving–not thriving. Do you struggle with gut issues? Have you found relief through diet change? Comment below!